Long, drop-shoulder sleeves; button cuffs. 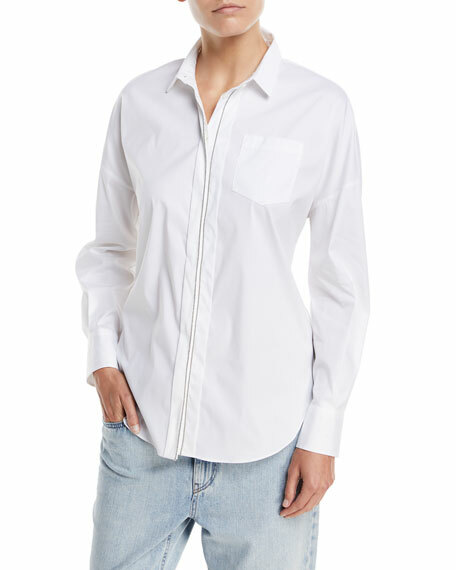 Poplin with tonal princess seaming for slim fit. Approx. 24"L down center back. Notched stand collar; concealed front closure. Long sleeves; barrel cuffs. Straight hem. Cotton/nylon/spandex. Made in Romania. Fit note: Model is 5'10"/177cm and wears size US 2/S. Finley "Jackie" cotton-blend blouse in peaks island plaid. Approx. length: 27"L from shoulder to hem; 29"L down center back. Spread collar; button front. Three quarter sleeves; tie cuffs. Semi-fitted silhouette. Shirttail hem. Short sleeves. Cotton/viscose/polyester. Plastic buttons. Machine wash. Made in USA of imported material. Finley "Jenna" stretch-cotton blouse with tiered ruffles across front. Approx. length: 31"L from shoulder to hem; 31"L down center back. Finley "Jenna" stretch-cotton blouse with tiered ruffles across front. Approx. length: 31"L from shoulder to hem; 31"L down center back. Spread collar; button front. Three quarter sleeves. Yoke seamed back; box pleat. Semi-fitted silhouette. Shirttail hem. Cotton/Lycra® spandex. Made in USA of imported material.